We’d love your help. Let us know what’s wrong with this preview of The Blind Earthworm in the Labyrinth by วีรพร นิติประภา. On the day Chareeya is born, her mother discovers her father having an affair with a traditional Thai dancer. From then on, Chareey's life is fated to carry the weight of her parents' disappointments. She and her sister grow up in a lush riverside town near the Thai capital, Bangkok, captivated by trashy romance novels, classical music and games of make-believe. When the l On the day Chareeya is born, her mother discovers her father having an affair with a traditional Thai dancer. From then on, Chareey's life is fated to carry the weight of her parents' disappointments. She and her sister grow up in a lush riverside town near the Thai capital, Bangkok, captivated by trashy romance novels, classical music and games of make-believe. When the laconic orphan, Pran, enters their world, he unwittingly lures the sisters into a labyrinth of their own making as they each try to escape their intertwined fates. 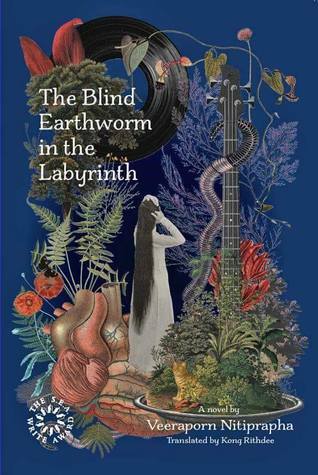 The original Thai langaue edition of The Blind Earthworm in the Labyrinth won the prestigious South East Asian Writers ("S.E.A. Write") Award for fiction and was best-seller in Thailand. It is translated into English by Thai film critic and recipient of France's Chevalier dans I'Ordre des Arts et des Lettres, Kong Rithdee. To ask other readers questions about The Blind Earthworm in the Labyrinth, please sign up. It's not the style of prose I usually read, but I was completely drawn into this magical and absolutely lyrical world. Nitiprapha paints a world that is almost too full of senses - smells, colours, tastes and sounds. Great translation - I really hope her other books will also be translated some day. อ่านรอบนี้รวดร้างร่วงหล่นจนถึงขั้น ก็ไม่เห็นแปลก คงเป็นบรรยากาศเซื่องเศร้าเปล่าโหวงจากสำนวนย้ำๆ ที่อวลกระชากความรู้สึก ดื่มกินจนเอมอิ่มกับมายาคติอีกทั้งรสนิยมวิไลทั้งหลาย และหากแม้เชื่อมโยงกับตัวละครใดแม้หนึ่ง ยากนักจะหักใจไม่ให้ยอมตกในวงกตนั้น ..